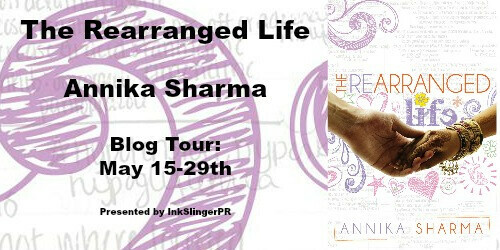 Today is my stop during the blog tour for The Rearranged Life by Annika Sharma. I’ll share my review with you and there is a tour wide giveaway. Enter James St. Clair, the smart, challenging and heartbreakingly handsome American. As Nithya and James fall in love, she questions the future she and her parents have always planned. Now, Nithya has a choice to make: become a doctor and a good Indian bride, or step away from her family and centuries of culture to forge her own path. The decision she comes to takes her on a journey that transforms how she sees her future, her relationships with loved ones, and how she learns to put herself back together when even her best-laid plans fall apart. When I first came across The Rearranged Life in a tour e-mail I knew I had to read this book, so I signed-up for the tour and was excited to receive a review copy. The plot with an Indian girl who falls in love with an American boy sounded interesting and I was looking forward to learn more about Indian culture. When I started this book there were some clichés and the plot was predictable and I couldn’t get used to the writing style. But I am happy I continued reading as it got better and better after the rough start. Like I mentioned I had some issues with the writing style of this author as it didn’t flow smoothly in some places, like there was a fast forward, but then a scene was throw in of something that happens during the forward and it just felt a bit weird as you didn’t really got to experience the scene. There are a few incidents like that and they felt a bit jarring. What I loved most about this book was the story, it’s a beautiful story of an Indian girl who falls in love with an American boy and the struggles they go through to be together. The differences between their cultures and the power of love. It’s about finding yourself, going through hard things and making decisions. Taking control of your life even when it takes turns you don’t expect. 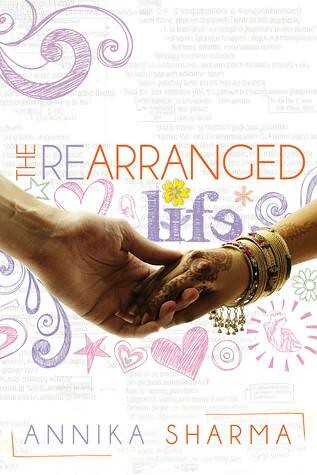 I liked learning more about Indian culture, there’s a wedding the main character visits in the begin of the book and some scenes about Indian food and their house and family in India and why the arranged marriages exists and I was surprised how open these arranged marriages are. It’s not like they didn’t had a say in the matter and the families tried to make matches that worked. It was all interesting to hear. And I was happy every time I recognized an Indian dish, although there were even more that I had never heard of before. I liked the characters and I could easily relate to Nithya, she’s a good girl, who does what is expected of her. She is a genuinely nice person and I recognized a few traits I have myself as well. She grows and changes a lot during this book and I loved seeing those changes and seeing her finding her path in life. This book is more about that, finding your path in life and the difficulties of dealing with what you want and what is expected and what happens if things don’t work out as planned. I also liked Sophia, Luca, James and James and Nithya their families. The focus is on Nithya, but we still get a feel for the other characters as well. Then there’s the romance, while I liked the romance and though they were good for each other, I never really felt their emotions and feelings. I always felt like there was a bit of a distance, more like telling a story than experiencing it. On paper I liked their romance, but I never really felt their connection. There is a bit of a love triangle, but it’s not really fair to call it that as it isn’t how it’s usually is in books. I liked how it was handled and how it also showed the other option. James and Nithya keep some lies by omission at first and I didn’t like that Nithya didn’t tell him things earlier. And then there was this part where I had expected more of James and it was just a bit disappointing on both sides. After that their romance went in a direction I did like and I was also happy with the ending. The book has a bit of an open ending, it doesn’t wrap things up nicely but leaves things open., Normally I don’t like that, but I think it was done well here and the open ending fit the book and the last chapter was written in a way that you did have some idea of what comes next, but the main character even describes it as an open road and that’s how it ends as well. To conclude: I really enjoyed this book, the begin was a bit slow and cliché, but after that I really liked this book. The characters are great and it’s a beautiful story about finding your path in life. 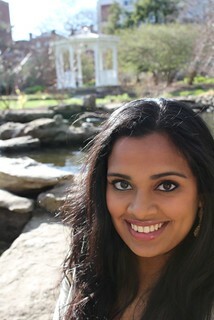 I also liked learning more about Indian culture and how the arranged marriages work. I had some issues with the writing style as it didn’t flow well in some places, but that’s a minor issue. And while I liked the romance and think they are good for each, I didn’t really feel it, they also keep some secrets at first which I didn’t like. The ending was a bit open, but it really fit the story and I liked how the book ended. ​The Rearranged Life, will be hitting shelves on May 15th, 2015, published by Curiosity Quills Press. Let me know what’s the last romance book you read where the characters were from different cultures and whether you liked that book? Sounds really interesting, I’m definitely going to check it out! I hope you like it! It’s was a great book, except for the minor issues with the writing style. Oh, I would have picked this up for the same reason. It sounds like one that I would have liked. Glad it was good even with the fast forward feeling to some scenes. This one is going on the wish list. I got to review a book by Simi K. Rao called An Incurable Insanity about an Indian arranged marriage where the gal comes to live with the guy in Los Angeles and has to get used to marriage and culture shock. I thought she was a bit high strung, but it was still a good story. Yeah a few scenes felt a bit rushed or off, but beside that it was a great book. I a so happy I got the chance to read this book and it was fun to leanr mroe about indian culture. In this book the girl already lived in america, so it was a bit different. She basically lives two lives and both cultures and while she is indian, she’s also american. That also sounds fun to read about an indian girl who’s never been in america, must be a culture shock then! I am thinking food is an important part of a culture ;). And I love reading about food, so I don’t mind. Although the food scenes certainly made me hungry! I’ve never, ever read a book about two characters From different background and cultures falling in love but this one sounds promising. Not too sure about that there is a slight love triangle and that you didn’t feel a connection. It was a fun concept and nicely worked out with how the difference in their cultures and their families made for the conflict. It was nice to see how they made it work and how their differences could cause some issues. Let’s say that if you read the blurb, you probably know already who’s she going to end up with. I think the love triangle was more to show the other side, what she could have. It was important for the story and for the main character to see things differently and then make a decision. Their romance was really sweet and well done, but I just never felt their love, it felt like they focussed more on describing it than lettting the reader feel the romance. But it was still a good book even with the slight issues. Hmm, I can’t think of any romances were the cultural differences were a big issue. I mean, I’ve probably read them, but I dont pay much attention to that. Glad you enjoyed this one:) The cover is pretty cute! I don’t think it’s a big issue in most books, but in this book it was really focussed on the cultural differences. It was interesting to read. And I agree the cover is pretty cute, throghout the book there where also drawings at the start of a new chapter, it was nicely done! Oh wow, I love when books have that! It sounds like an awesome book to get in paperback for the drawings. Yes it’s great when a book has things like that. I haven’t read a lot of books with formatting like that, some have little images at the chapter start. And this was with coloured pictures even in the netgalley arc edition, I was impressed! I like those extra touches like that. So do I! I think when you gets little touches like that in books it shows the author and team went above and beyond. Kinda like they wanted to add some specialness to it, ya know? Lanie recently posted…Pew! Pew Pew! Books to Videogames! Exactly! And it adds a bit of a feel to the book. I once read an india inspired steampunk book which had chapter numbers that looked indian, it added a bit of that feel to the book. That is really neat, I like how the older books have a design on the side of the pages. That was always really cool to me. I dont’t think I ever seen a book with a design on the side of the pages, sounds cool! Mhm, those really old ancient books! Like medieval ones:D! benish recently posted…Mini Reviews ♥ Tiny Pretty Things, Killer Within, Black Iris & more. I hope you’ll like it as much as I did! Looking forward to hear what you think of it! Oh I remember your review of 5 to 1 on your blog, I’ll check out those other two books you mentioned. It was fun to learn more about another culture and the message of following your heart and finding your own path was beautifully interwoven in the story.